Zimbabweans gave a jubilant welcome to Brazil's football team as they took on the national team in Harare. It was a warm-up match ahead of the World Cup which kicks off in South Africa next week. The BBC's Brian Hungwe says there were frenzied scenes of joy and about 50,000 fans were packed into the stadium to see legendary Brazilians players like Kaka and Robinho. Their mood was not dampened by Brazil's 3-0 victory over Zimbabwe's "Warriors". 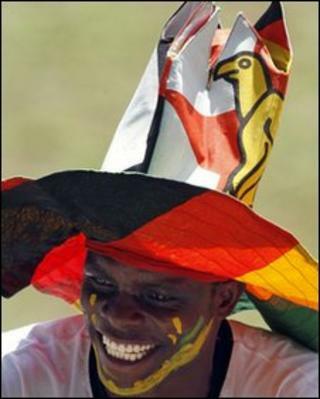 It was the first time since independence in 1980 that a non-African team has played in Zimbabwe. Our correspondent says the match was also attended by President Robert Mugabe and Prime Minister Morgan Tsvangirai. Brazil have won the World Cup five times.